The Glidecam is a wonderful device that uses counterweights to allow you to achieve truly professional looking movement shots in your films. Today we’re taking a look at several of these devices to help you find the best Glidecam for DSLR video production to suit your needs as a filmmaker. We’re going to get right into our picks for the best Glidecam. Stick around afterwards to see us talk about what exactly Glidecams do and how they work. Update April 2019: Most of our previous recommendations are no longer available, so we’ve fully updated our choices! 2 What Does A Glidecam Do? 3 How Does a Glidecam Work? The maximum payload weight is the heaviest weight that can be balanced on a rig. If your rig is lighter or heavier than the recommended weights (Including accessories of course), you may be unable to properly balance the load and the glidecam can lose effectiveness. All of our suggestions are good fits for DSLRs, but if you plan on having excessively heavy rigs with tons of accessories, you’ll need to make your selection accordingly. Glidecams are typically made up of one of two materials – aluminum, or carbon fiber. These are both excellent materials that are worthy of being the industry standard, but there is a very slight difference. Carbon fiber is lighter, more resistant to temperature absorption (meaning it’s more comfortable to grab in extreme heat or cold), and is a bit less durable. It is growing to be very popular in consumer grade products, as the use is not as strenuous as it would be in everyday professional use. Aluminum on the other hand is heavier, but also marginally more resistant to damage. Aluminum products can come off scratch-free from impacts that could potentially break carbon fiber. That is not to say that carbon fiber is fragile however, as all of the carbon fiber products on this list are built to withstand plenty of damage. Most professional-grade products have an aluminum construction. Here are just a few reasons why every filmmaking toolkit needs a Glidecam. They make huge improvements to your production value – The fastest way to look like an amateur is to have overly shaky footage. Glidecams allow just about anybody to come off looking like a pro! They’re really affordable – You can get a great glidecam for around $50-150, while you would spend over $600 to get a Gimbal that would produce similar effects. They’re portable – Gimbals and steadicam rigs can require massive cases to bring them around, while glidecams are usually quite small when disassembled. Includes 14 large and 4 small Counter Weight Discs, and 4 large Camera Platform Weight Plates. 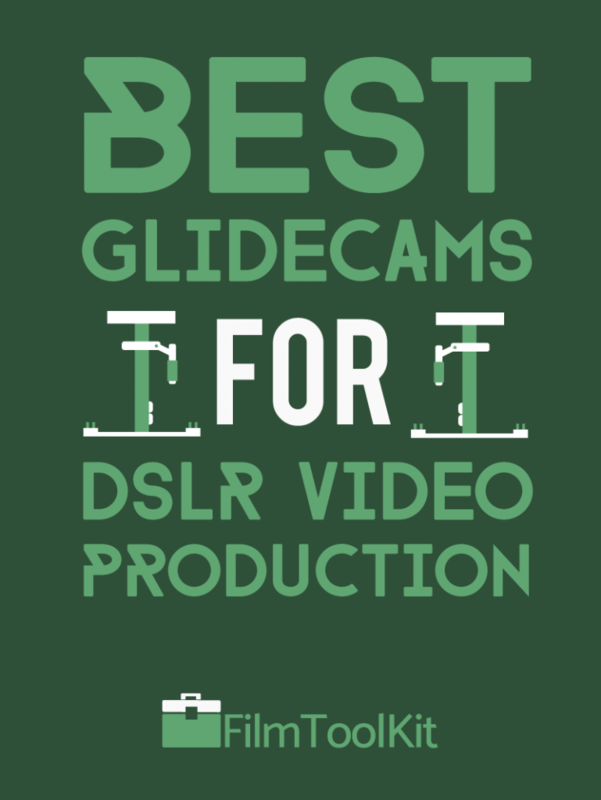 Is anybody really surprised that the best glidecam for DSLRs on the market comes from Glidecam themselves? The Glidecam XR-Pro is a relatively recent introduction from Glidecam that brings their excellent tech and build-quality to a more affordable price point – making it the perfect product for DSLR users who want the best product possible. It’s lightweight, and the wide variance in sizes that the counter-weights have means that you’ll be able to balance literally any payload up to ten pounds. Unlike cheaper options on this list, this Glidecam also has telescoping features, giving you the freedom to maneuver your camera at any height you need. The aluminum body is very durable, and has been Glidecam’s material of choice throughout the years to ensure the reliability of their products. It’s a bit more heavy duty than what you’ll find on the cheaper products on this list. Ultimately it comes down to personal preference to decide on whether the increased sturdiness is worth the weight for you. This is the most expensive product on this list, but you are truly paying for quality. Glidecam is the industry standard in the professional field, and the durability of this glidecam is unmatched if you’re willing to spend the money. Plus, glidecam is a great company that will repair or replace your device free of charge if there are any defects within the first year. 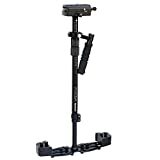 The XR-Pro is an excellent product, but if you want to be able to support heavier rigs with a glidecam product you’ll find yourself spending well over $500. This is why if you have a camera setup that weighs more than ten pounds, we recommend the Flycam Redking, another excellent, well built product that can support payloads up to 15.4 pounds. Flycam is an excellent, reputable brand that in our opinion will be more reliable than most of the cheaper choices, if you’re going to be using your stabilizer in a professional capacity, especially due to the aluminum body. 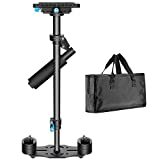 It features most of the key elements we loved about the XR-Pro including a telescoping central post, a mounting area for an LCD monitor, and a 3-axis gimbal. However, the RedKing brings even more value with the addition of a quick-release baseplate, allowing you to quickly mount and dismount your camera rig on the fly. Do keep in mind however that the increased maximum payload comes at a price – the RedKing is nearly double the weight of the XR-Pro when they are each unweighted, meaning if you have a rig that is under 10 lbs, you’ll definitely want to stick with the glidecam offering to save your arms. Finally, we appreciate the inclusion of a storage/carrying bag, as hauling these stabilization devices around safely can be quite annoying if you don’t have one. If you’re looking to get the most bang for your buck, the HD-3000 from Flycam provides a remarkable cost-to-performance ratio that simply cannot be overlooked. This is a much more compact, and consequently lighter flycam than the RedKing, and is perfect for anyone with dslr rigs up to eight pounds. You get all of the same great features including the telescoping height, free storage case, and quick release baseplate at a very remarkable price. We don’t have a whole lot else to say about this one due to it’s similarity to the RedKing. However, one additional feature the HD-3000 has we didn’t see anywhere else was the addition of a table clamp used to balance the stabilizer quickly! This is great for people who mostly shoot in their home or studio, as they can have it always set up to get their rig balanced in no time. Included Quick Release Plate and carrying bag. We’ve recommended Neewer products in just about every category on our website, and their glidecam offering is another excellent product. If you are a more casual user who would prefer the lightweight performance of carbon fiber, or simply have payloads that are on the lighter side (6lbs or lower), this is probably the best choice for you. While the maximum payload is much smaller than the previous options, not everybody has a massive rig, and the weight limit is sufficient to support just about any DSLR rig. The light-weight carbon fiber construction means you’ll be able to bring it more places and use it longer without fatigue in your arms. It doesn’t feature holes to mount extra gear like the previous choices, and it is a bit more fragile, but the amount of money you save here is enough to justify the reduced features. If you’re only shooting with a cheaper DSLR like a T6i or 80D, it wouldn’t really make sense to splurge on a glidecam that costs a third of what your camera does anyways. For the majority of casual vloggers and content creators, this will be your best option. 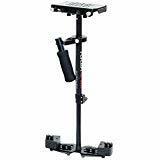 Adjustable Telescoping Height Range: 15”-/23”. Includes carrying bag and microfiber cleaning cloth. Backed with 2-year warranty. 100% satisfaction guaranteed. 24/7 customer support. If all of our other recommendations were still too expensive for you, this is the best one we could find at a much lower price point. Coming in at a staggeringly cheap price point of under $90, the IMORDEN carbon fiber s-60c is a very strongly reviewed Glidecam that is perfect for starters. This stabilizer is designed for cameras between 2-6 pounds, and will likely be ineffective for anything lighter or heavier. Despite the low price, the construction is very rigid and high quality, with a carbon fiber shaft ensuring the Glidecam is no heavier than it needs to be. The tool by itself only weighs a little over 2 pounds, and it can extend between 15 and 23″. It’s a lot smaller than the more expensive options we reviewed. Unlike even the most expensive offerings on our list, this one comes with a quick-release plate already attached, so you can pull it out and switch cameras with ease. Its small size means that you can use it with small DSLR setups, and even tiny cameras like cell phones and Gopros! This item is clearly optimized more towards the consumer market than professionals, and we mean that in the best way possible. There are a few offerings that have a cheaper price, but the reviews were too inconsistent for us to recommend one of those. Many of these cheaper options are prone to defects or breaking or just poor performance overall. 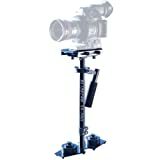 Of course the premium options from the actual Glidecam company will work the best, but if you are on a tight budget, IMORDEN seems like your best choice. What Does A Glidecam Do? Lets say you went all out bought a brand new DSLR, lighting kit and stabilization for your first indie production. Everything is going smoothly – literally – with all your still shots. You dismount your camera from your tripod for the big, long, Birdman-esque handheld shot, and it goes perfectly. Then you review the footage at the end of the day and it looks like it was shot by a nervous child. Shaking all over the place. If you want to shoot professional quality cinematic footage, you’ll need some sort of stabilization for your moving shots as well. That’s where the Glidecam comes in. 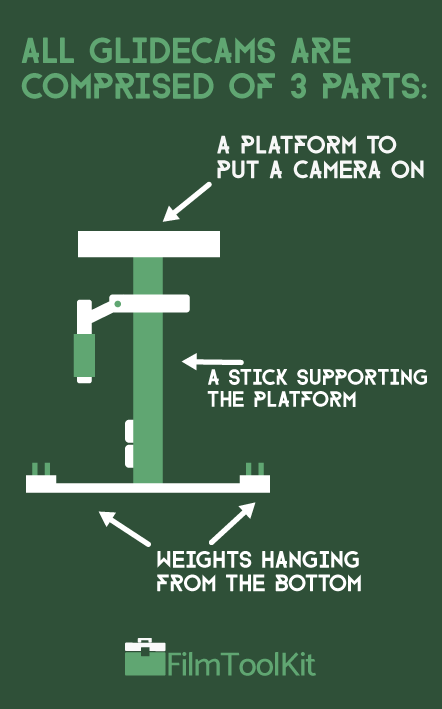 The Glidecam uses a counterweight balance system to reduce jerky movements and bouncing. We talk about how this works in the section below. Here is a sample video from YouTube that illustrates the effect that a Glidecam has on your footage. How Does a Glidecam Work? The first time you throw your camera onto a Glidecam, it’ll feel like magic. All of a sudden all your footage becomes so much more fluid and your Vlogs start to look like actual movies. So what’s actually happening here? There are multiple factors contributing to the stabilization you get with a Glidecam. The weight of the Glidecam helps, but isn’t enough to achieve motion. If it was, everyone would just strap a brick to their camera and start shooting. What ultimately makes it work is the balance system between the camera and the counterweights. This design makes large movements very smooth, as the device swings similar to a pendulum. Using this pendulum in conjunction with the dynamically moving handle allows users to create “gliding” movements rather than jerky ones. To a novice, there will be a noticeable yet imperfect improvement in movement quality. However, a more experienced user will be able to walk in a fashion that offsets every camera swing, creating perfect movements with no bouncing or jerking. It’s just as effective as a steadycam as long as you don’t need to run or move in crazy patterns.